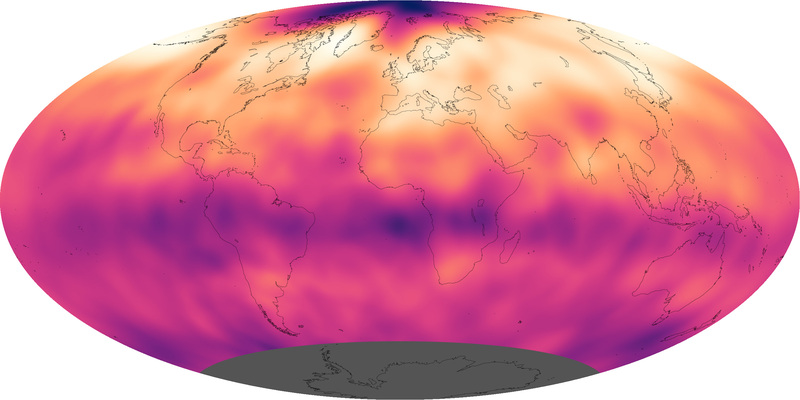 GeoGarage blog: Global warming and oceans: what are the known unknowns? Global warming and oceans: what are the known unknowns? For five years an international team of experts, led by NASA emeritus glaciologist Robert Bindschadler and funded by the National Science Foundation and NASA, planned and orchestrated a mission to drill through the floating ice shelf of the Pine Island Glacier. Finally they persevered over harsh weather conditions, a short Antarctic field season, and the remote location of the glacier, and installed a variety of instruments to measure the properties of the ocean water below the ice shelf. Understanding how humans are changing the climate requires experts from many different areas. Physicists, chemists, engineers, mathematicians, biologists, atmospheric scientists, oceanographers, social scientists, the list goes on. Scientists studying the Earth's climate work out descriptions of how humans are interacting with the environment, how those interactions cause changes, and how measurements can be made. The methods that have been developed to measure the Earth's climate include true engineering marvels. There are instruments on satellites that measure the rising sea levels and surface temperatures of oceans, land surfaces, and atmosphere. But satellite instruments can't see below the surface. Perhaps the most important component of the Earth's climate, and perhaps the hardest to measure, is the oceans that cover over 70 percent of the Earth's surface. Over the past decades and even centuries, humans have used various techniques to measure oceans, from buckets that were dragged through the ocean waters to collect samples, to modern autonomous devices that measure the oceans day and night throughout the year and report data by satellite. A major new development since about 2005 is use of floats that pop up and down to sample the top 2000 meters of the ocean for temperature and salinity. These enable us to calculate the increase in heat and the changes to the acidity of the ocean waters. It seems logical that throughout the decades, as our measurements have become more sophisticated, our understanding of the oceans has improved. But, from a climate perspective, we must address how today's oceans differ from the oceans 10, 20, or 100 years ago. Sure, the oceans are warmer now because humans have loaded the atmosphere with heat-trapping gases, but how much warmer? How do we compare today's sophisticated measurements with yesteryears crude ones? For instance, if measurements in past decades were biased or their assessed depth was off, it could appear that the oceans have not warmed much in certain periods. Such errors would also have tremendous consequences for our predictions of what the climate will be like in the future. This complicated topic is the subject of a recent paper my colleagues and I published in the journal Reviews of Geophysics. Nearly 30 of the world's top oceanographers collaborated on a massive study that not only went back through the history books to describe the evolution of ocean temperature measuring methods, but also looked forward to future measuring techniques. The paper found that while all the evidence shows the Earth is warming, without pause, there are still unanswered questions and unmeasured parts of the oceans. Underneath ice sheets and deep in ocean basins are just two regions that need more attention. One of the world's pre-eminent oceanographers for, among other things, his important work measuring heat transferred to very deep ocean waters, is Dr. Gregory C. Johnson. "This review points to the need to expand the innovative, year-round, broad-scale measurements of the upper half of the open ocean volume so successfully pioneered by the international Argo Program all the way down to the ocean floor and into the ice-covered polar regions, so we can make well-resolved, timely, and truly global assessments of the amount of heat being absorbed by the ocean." After an unusually cold summer in the northernmost latitudes, Arctic sea ice appears to have reached its annual minimum summer extent for 2013 on Sept. 13, the NASA-supported National Snow and Ice Data Center (NSIDC) at the University of Colorado in Boulder has reported. Analysis of satellite data by NSIDC and NASA showed that the sea ice extent shrunk to 1.97 million square miles (5.10 million square kilometers), the sixth-lowest on record. This animation shows daily Arctic sea ice extent and seasonal land cover change from May 16 through Sept. 12, 2013, the day before the sea ice reached its minimum area of coverage for the year. The data was provided by the Japan Aerospace Exploration Agency (JAXA) from their AMSR2 instrument aboard the GCOM-W1 satellite. In short, we are doing well, but we could do better with more deep-ocean measuring equipment. A similar reaction comes from Dr. Kevin Trenberth, who not only is one of the world's top climate scientists, but is also recognized as a top communicator, winning the 2013 American Geophysical Union Climate Communication Award. Dr. Trenberth has been quite active in ocean heating studies, most recently publishing an important paper which calculated significant rates of heating in the ocean. "an excellent review of the history of ocean observations and very revealing about the problems, the issues, and the advances. Most people don't realize the state of the science of ocean observations and this paper is in that sense an expose." Drs. Johnson, Trenberth, and others who study climate change every day are hopeful that their work will help us quantify how much climate change has occurred and what the future may hold. While climate science, like other scientific endeavors does not package answers in neatly wrapped exacting answers, what we can say with certainty that is the Earth is warming and the best place to measure that warming is in the oceans. The best ocean measurements show a continuous heating that is largely from human-emitted greenhouse gases, and it is an important component of sea level rise. Indeed sea level rise may be the best single indicator of a warming planet: the other major contributor is additional water from melting land ice. Since satellite altimeters were placed in orbit in 1992, sea level has risen at 3.2 mm/year. That should be alarming to everyone.